Notification with the passing of retired Pan Am/Delta pilot Captain John Cartwright Cook IV, age 81. Captain Cook joined Pan American 02-13-1967 and retired with Delta Air Lines. He is survived by his wife Jennifer, their children and grandchildren. John Cartwright Cook IV died Tuesday, April 25th at Stamford Hospital at the age of 81. He was diagnosed with brain cancer in December 2016 and fought the disease the way he lived - competitively and with every cell in his body. Born in New York City on July 23, 1935, he grew up in Bronxville, New York and attended Roosevelt High School. He graduated from the Georgia Institute of Technology in Atlanta, Georgia. He fulfilled his dream of flying, and was an airline pilot for more than four decades. As a Lieutenant and Naval Aviator in the United States Navy, he was designated Patrol Plane Commander in the P2V model aircraft. He subsequently flew for Pan Am for 25 years and Delta Airlines until his retirement in 1998. John lived life fully and had many avid interests. 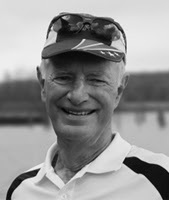 He put his whole self into everything he did: skiing, tennis, running, speed skating, photography, astronomy, and competitive sailing, including the Newport to Bermuda race in 1982. Triathlons were his greatest passion/obsession for over twenty years. He competed in races all over the world and was a member of the USA Triathlon team. In 2011, he won the World Championship in Beijing. In 2015, he received the USA Triathlon All American Award. He completed nine Ironman races, including seven in Kailua-Kona, Hawaii. He completed his most recent triathlon this past September in Malibu at the age of 81, just prior to being diagnosed with glioblastoma. He has donated his brain to science through Memorial Sloan-Kettering Cancer Center in order to help further the understanding of this devastating disease. Ironman John Cook is survived by a large and loving family, including his wife, Jennifer "Kiki" Cook; children Karin Cook, Jennifer Polk, Courtney Flynn, John "Hatch" Cook, and William Cook; and his grandchildren Lucian, Georgia, June, Asher, Billy, Jameson, and Kayla; and his sister Sara Meehan. He was predeceased by his first wife Joan Barrett Cook and his brother E. Thomas Cook. He leaves behind a legacy of lasting friendships forged through a vibrant and varied community of life enthusiasts.